Song Without Words No. 1 from David Arditti on Vimeo. This is a new rendition of Ceremonial March No. 1 (Op. 45a) using Note Performer virtual instruments with Sibelius 7.5, @ David Arditti. This is as yet unperformed. Any orchestras or conductors interested, contact me. For instrument line-up see here. The earlier rendition was produced with a combination of software and hardware instruments, but this is entirely software and at least as good if not better. Such realisations also have the benefit of being far quicker to produce. I will be playing a new short work for piano entitled Moment Musical in a convert given by London Composers Forum at 12 midday on Friday 6 March in the church of St Mary’s, Putney. The concert is free with a retiring collection. Other composers in the concert are Andrew Glynne, Ann Wolfe (who sadly died last year), Janet Oates, Laurence Glazier, Martin Jones (pictured with me below), Peter Terry, and Tony Matthews. I’ve now uploaded a recording of the synthesised score of Ceremonial March no. 1 (Op 45a). This is played from Sibelius 7 using in general Sibelius sounds for the strings and a hardware synth for the wind, which I think gives the best result. For some reason the recording goes a bit poppy at the end. I’ll fix that when I have diagnosed the cause. My three-movement Suite in C for solo guitar (Op. 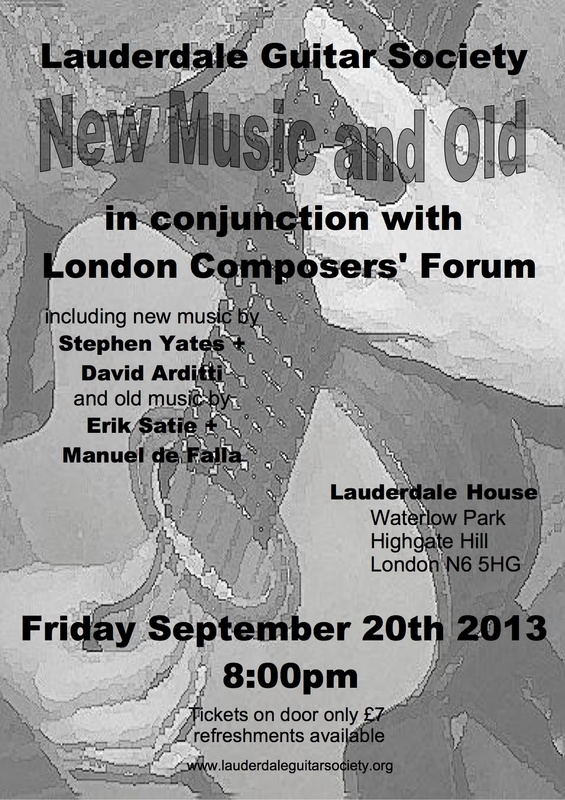 43) will be played for the first time by Dennis Cooke of Lauderdale Guitar Society on Friday 20 September at Lauderdale House, Highgate, as part of this concert, which also features other new works. A late note that Time and Tide (Op. 37) will be performed in an arrangement for flexible small wind ensemble by the London Consorts of Winds on Sunday 16 August 2013 on Clapham Common Bandstand. The concert, conducted by Alan Taylor, will start at 3:00pm, and also include works by Mozart, Shostakovich, and more. Flute, Oboe, Clarinet in B flat, Clarinet in E flat, Piccolo, Bass Clarinet, Bassoon, Alto Sax, Trumpet, Horn, Trombone. My Suite for Brass Quintet, Op. 27, is being played by high-quality professional ensemble Total Brass, in this concert on Friday, presented by the excellent London Composers Forum. 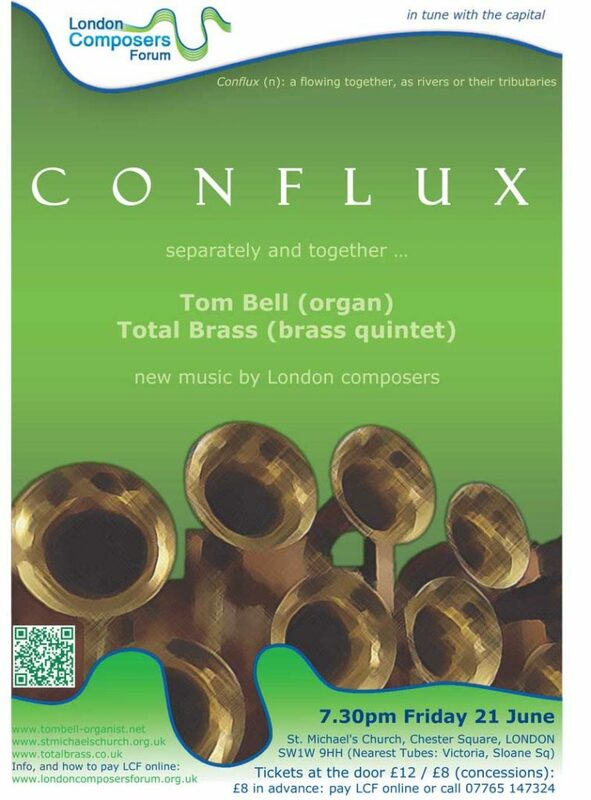 The concert includes music for organ, music for brass, and for the two together, by Tony Matteews, Alan Hilton, Martin Jones, Michael Regasn, John Holland, Alan Taylor, Derek Forster, Andrew Bungay, and Cedric Peachey. 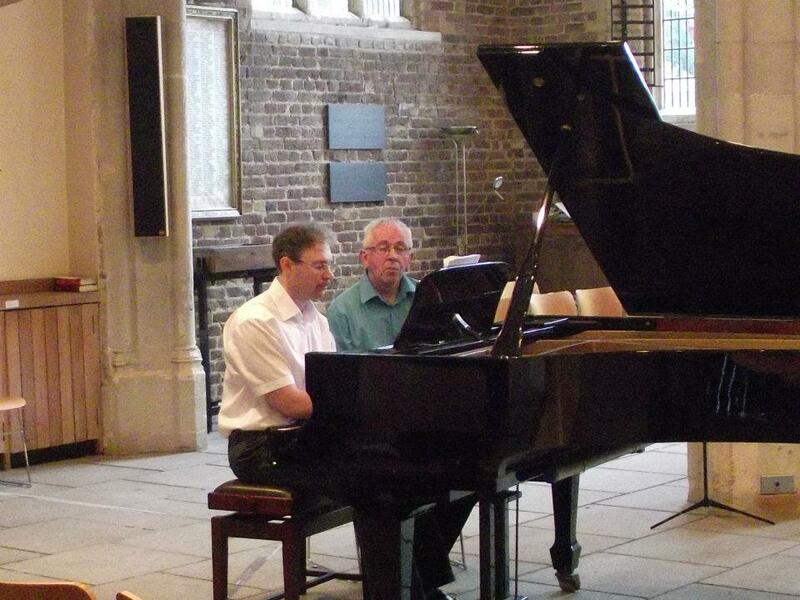 It is at 7:30pm at St Michael’s, Chester Square, London, SW1 (near Victoria Station). (This is also the church where Arthur Sullivan was organist for a short while). Tickets are £12 (£8 concessions), on the door, of from LCF, or call 07765 147324. Small audio and PDF score samples of the Suite for Brass Quintet are available from the MusicforBrass.com website, where it is also possible to purchase the music. Here’s a new experiment: putting a video of a score of a newly-written work online. This is possible through a demo version of Sibelius 7 First software, which has this useful feature buried in this cut-down version of Sibelius 7, which (annoyingly) is not available in the full version of Sibelius 7, which I have actually bought! Anyway, this is my Suite in C for guitar, Op. 43, which may require some further revision for playability (I am not a guitar expert). It came out of the London Composers Forum writing for guitar project with Lauderdale Guitar Society, and has already had the benefit of some input from society members Martin Byatt, Dennis Cooke, and Alex Lewis. There are three short movements, titled Prelude, Valse, and Toccata. Suite in C for guitar from David Arditti on Vimeo. Did you know that 2012 has seen celebrations of the centenary of the death of Britain’s first (and probably still most famous) black “classical” composer, Samuel Coleridge-Taylor? On Saturday I attended a gala concert of his music in Norwood, including the Ballade in A minor, Violin concerto in G minor, and Hiawatha’s Wedding Feast, and on 30 December a plaque will be unveiled on the house in Croydon at which he died. There is now a “Network” for sharing information and events related to this neglected genius: the Samuel Coleridge-Taylor Network. I consider Hiawatha to be one of the greatest choral works ever written. It’s up there with Messiah, Elijah etc. The first part, Hiawatha’s Wedding Feast (the most commonly performed of his pieces), though built of seemingly simple, repetitive musical elements, somehow builds tremendous impact and emotion. The second part, The Death of Minniehaha, however, is the best part, heart-rendingly tragic. In the third part (they were all written as separate works), Hiawatha’s Departure, the level of inspiration falls slightly and there is a bit of musical treading of water (though not as bad as you find in parts of Elgar’s King Olaf (also a setting of Longfellow) or The Apostles). However, in the last few pages, the actual “departure”, it recovers, S C-T giving us one of the most refulgently “Edwardian” purple sunsets in the musical literature. There are clearly many undiscovered gems from the pen of this composer yet to be given a modern airing. As an encore on Saturday, the excellent Croydon Opera with Westminster Philharmonic Orchestra gave the first modern performance of one of the Choral Ballads. This had been reorchestrated by Stephen Anthony Brown (whose main role in the concert was singing the tenor solo in Hiawatha’s Wedding Feast most beautifully) from the piano score, the full score having been lost in Word War II. It was another revelation of English romantic music. Brown was well-qualified to do this orchestrating work, having copied out all the parts from S C-T’s full score of his opera Thelma for as performance by Surrey Opera earlier this year. I have long been acquainted with his capabilities as a tenor, as he gave the first performance of my Joyce song-cycle Chamber Music back in 2001. I’ve now got the Sibelius 7 update. Played with it a bit and initial impressions are that the redesign of the interface would make it much easier to learn for a beginner, but for an established user it doesn’t do much that it didn’t do before, just everything has been rearranged, so you have to spend time relearning it. The orchestra/band sounds are far better than before, but I have to say I still prefer the sounds from my 10-year old Yamaha DGX-200 synthesiser, probably because I am used to them, not because they are more accurate. Early days, so impressions may change. I’ve not really tested the string sounds yet. The sound library is huge, 36GB, and there is no way I could fit it on my MacBook HD, but the Sibelius 6 sounds are still available from within Sibelius 7. Many customised settings were lost in the transition from Sib 6 to 7, and defaults had to be changed again (such as keyboard shortcuts, playback options, and getting rid of the annoying introductory music when the program boots AGAIN), so this was all a nuisance in upgrading this program.